Welcome to Tech Woes, where a stupid answer is only a phone call away. Unfortunately, the intentionally bad, and hopefully humorous, advice on this site resembles the advice people frequently get from technical support providers. Many of you know exactly what I mean. 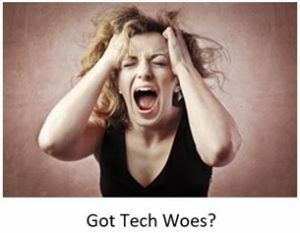 Do you suffer from tech woes? Meet the helpful folks in Technical Support. In the many years I have worked in IT, I encountered a diverse lot of technically unsophisticated people. They had one thing in common with each other — they suffered from tech woes. My boss called me into her office, because her modem “didn’t work.” It turned out that the only problem with her modem was that it was facing away from her, so she couldn’t see the light! A colleague could not log in to our administrative system. When I arrived at his office to help him, I discovered that his computer was not plugged in. It was probably a good thing, though, because it was also underneath a live hanging plant! Once we moved his computer to a safer location, plugged it in and turned it on, logging in was pretty simple. A coworker was quite upset that her computer was making a loud and continuous beeping sound. It did not take long to discover that the culprit was a book laying on her keyboard. Once the problem book was removed, we had a good laugh. A very affable colleague used to jokingly tell people, “There’s a short between the chair and the keyboard.” Another colleague tells people — after he fixes the problem — “It is a PICNIC. Problem in Chair, Not in Keyboard,” as he laughs with them, not at them. Tech Woes is dedicated to using geek humor to make fun of unhelpful and condescending technical support staff. Just the names have been changed, to protect the not so innocent.